Dear cousins, for some reason I had thought that many of us had at one time or another spent time in Figheldean, especially as one or two of you were actually christened there. But that idea turned out to be wrong, and most of the recollections here turn out to be my own. Many thanks to Mollie, Brian, Katie and Sue, and here is the result anyway. When I was three and Mollie a few months old we were dumped (as I felt) at 300 Figheldean for a few days while Mum & Dad went to Bournemouth for their honeymoon. This must have been the summer of 1936. ** To console me I was taken on a walk to the Mill, and on the bridge one of the aunts gave me a penny, which in my fury at being so fobbed off I hurled it into the river. For all I know it still lies at the bottom of the pool. We must have gone there again round about Christmas of 1940, and while I can recall nothing of the visit, I have a strong mental picture of bomb damaged buildings in Southampton Docks from the train as we passed through on the way from Salisbury to Portsmouth. And lots of snow around. ** I thought it was 300, but in view of the date - about August 1936 - it may well have been at Cliff End. Which reminds me that we do not know for sure exactly when our grandparents made this move. The visit that had most impact on me in a number of ways was in 1943-44. Dad had been posted to Newcastle, and for some reason it was thought a good idea for Mum, Mollie and me to stay with Aunty Dot and Nell at 300 Figheldean for a while. The sleeping arrangements were very strange, but then it was wartime and we all had to make sacrifices. The upstairs room at 300 was divided by a curtain, on one side of which was granddad’s big bed from which he never stirred. I got to sleep with granddad in the big bed, with a long bolster keeping us apart, which must have been most effective as I can’t remember exchanging a word with the old man. But then he was blind or almost I think, and probably deaf too. I’m quite surprised that he went on for over ten years more. On the other side of the curtain - and for this I am indebted to Mollie’s recollections, for I never looked as far as I remember – were two single beds where Mum and Aunty Nell slept, and a small bed for Mollie. In the big room downstairs was a Morrison Shelter, as shown here, although I don’t remember the bars in Aunty Dot’s . How would you get in? Anyway, this is where Dot slept. Come to think of it, I have suspicion that it was Dot who was upstairs and Nell in this shelter, but I may be wrong. I always remember Dot as a fearsome character, very much in charge of everything. I had to clean my shoes most carefully, and if I failed to clean the heels properly she would come out with this saying about “ a good soldier never looks behind”. Maybe this is the origin of the nickname I had while I was at school there – for some reason I was called “Dubbin”. I also remember having to scrub a big butcher’s table, which had probably once belonged to our great grandfather Thomas Jacobs, the butcher of Netheravon. 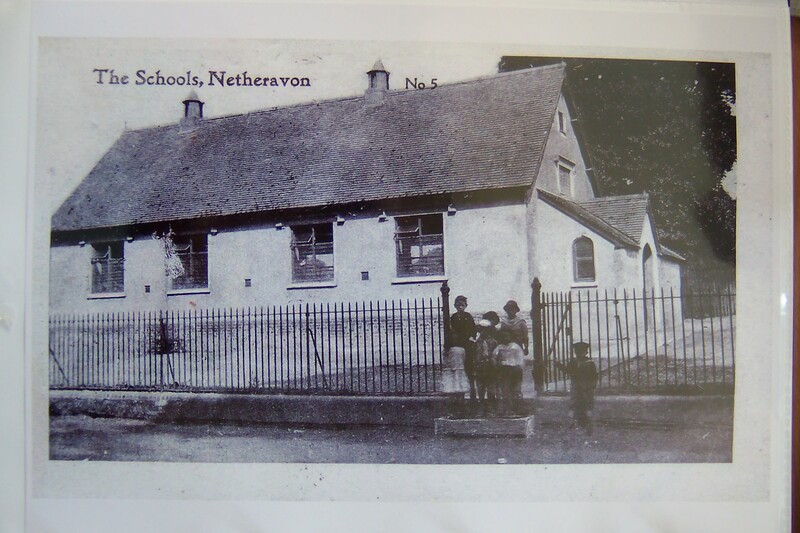 While Mollie I think went to the village school, I as a big boy (ten actually) went to school in Netheravon. We walked to school each day, over the river half way up the hill towards the main road, then across the field and into a wood which I think were the grounds of Netheravon House, occupied by some branch of the Army. The main thing I can remember about that trip was that there was a concreted pond in which we found crested newts, among other things. My best pal at this time was David Pennells, whose elder brother Roger was one of the two church organists. Miss Gent was the other, and I had a job pumping the organ for her practice for an hour on Saturday mornings, for which I got 6d, and again for the Sunday morning service, for a shilling! I still have the hymn and prayer book I was given that Christmas. It was hard work keeping the bellows full, guided by a plumb bob on a cord coming out of the side of the organ. I had to keep it between two marks, and make sure it was near the bottom when a loud piece was coming up, which used a lot of air. The hand pump has been supplanted by an electric one long since. At school I read a book about the fishes in the Avon, which started an interest which almost completely evaporated after a few years, At the time though I would spend long periods at and around the Mill looking for these fishes - perch, roach, tench, trout, grayling and of course the mighty pike, although I don’t think I ever saw more than one or two. Well yes, trout aplenty, but not the others. I had to content myself with catching tiddlers in a jam jar with a string round the top – that takes some skill you know – and had a collection of minnows, with a few sticklebacks and on one occasion a miller’s thumb. This I kept in a big glass carboy in the garden of 300, until going out one morning I found the whole thing frozen solid. There were Canadian soldiers billeted at Figheldean House, and Aunty Dot would have one or two of them to tea sometimes. This was great because they used to smoke cigarettes called Sweet Caporal, and the packets had Aircraft Recognition cards inside which were keenly collected by us schoolboys. At that time of course there was intensive training going on for the coming D-Day invasion, and no day went past without planes flying over dropping paratroopers on the plain near the clump, or towing gliders. It was while at the Netheravon School that I took the 11-plus exam, and together with my pal David Pennells passed to go to Bishop Wordsworth School in Salisbury. Sadly in a way, in late spring Dad was transferred back to the Portsmouth area, and we went to live there. I eventually got sent to the Portsmouth Southern Grammar School, and placed in the bottom form there as the Portsmouth authorities obviously had a low opinion of Wiltshire standards. Thus David P and I parted, and never saw each other again. My trip to Portsmouth was somewhat traumatic, as Mum and Mollie had for some reason gone ahead, and I was put on the train a couple of days later. Due to some mix-up, I was bought a ticket to Fratton Station, as that was the nearest to our new house in Eastney, but Mum & Mollie went to meet me at the Town station, at which I failed to arrive. When I wasn’t met I made my own way to our house by bus (“Could you put me off near Landguard Road please?”) but when I got there at number 3, obviously no one was in. Somewhat distressed I was taken in by the neighbours at No 5 until eventually my family arrived, equally distressed. So it was from Portsmouth that I saw all those huge squadrons of planes flying over for the invasion, and I got kudos for being able to say I had seen them practising for months beforehand on Salisbury Plain. Being at present surrounded by snow and especially containers of solid ice I was reminded of the time when we were staying in Figheldean that we went to Netheravon and caught newts, one of which we put in a large jam jar. After a heavy frost we discovered that newts can survive being frozen in ice but fish cannot! Note from Dave: Thanks Mollie, I had forgotten we froze the newts! I'm not sure of the date - probably very late 1940s or early 1950s. The scene is no. 300, Figheldean. A small boy (me) climbs a narrow wooden staircase which turns near the top to emerge directly into a room (it might, in fact, have been a landing, but it was being used as a bedroom). The boy had been instructed by his aunt Dot to "go and say hello to Granddad", and being a dutiful child he was complying - though he knew from previous experience that it would be a one-way conversation. There was not much furniture, and 65 years later only the bed itself comes to mind – there might have been a chair beside the bed, on which I might have sat, but I'm not sure. The bed was quite high, and upon it lay an old man in a nightshirt; he lay flat on his back and his full beard lay on his chest, rising and falling gently. Apart from this slight movement there were no obvious signs of life, but still the boy said the words he had been told to say: "Hello, Granddad". No reply - there never was, and to this day I don't know whether the old chap knew I was there, and if he did, who I was and whose child I was. But the boy, having discharged his duty, raised his head and looked around him, and on the wall, where it always had been every time he had come up to this room, was a picture, sort of sepia-coloured - probably stained by years of smoke from Granddad's pipe! - showing two heavily laden donkeys (or maybe they were mules) who appeared to be deep in conversation. There may or may not have been human figures too, but it was the animals who attracted the boy's gaze and held it, every time..... I don't recall ever having seen that picture, or even a reproduction of it, since Granddad died in 1955; I wonder what became of it? Of course, I always knew the family 'belonged' to Figheldean, and both brothers were born there, but their home , Chapel Bungalow, was condemned and they were rehoused in a Council house 4 Larkhill Road Durrington, where I was born. We eventually went back to Figheldean about 1958, on a mutual exchange. Incidentally, Chapel Bungalow, now called Brindisi, still stands! We were still in Durrrington when Grandad died, and I went to Bulford Village school. On the day of his funeral, I was trusted to walk up to Charley's Corner Durrington and catch the bus alone to Figheldean. Just along from the bus stop a car was parked on the track leading to Larkhill, A man opened the door and invited me to get in. Remembering all I had been told, I refused, and he drove back into the village. Within a few minutes, he returned - this time accompanied by my cousin Mary - who assured me :'It's all right, he's our uncle'...and I then accepted his offer of a lift to No. 300. I believe this to have been the first time I had ever set eyes on Uncle John; why did nobody think of this when he set off to collect me from the bus stop?? Living on the I.O.W. we didn't get there much, my earliest memory is walking to the Mill....didn't everybody go there...and on the way back we talked to Uncle Alf in the garden of 300?....I think that was the same time as I came over with Mum to see Granddad in Hospital...of course I was too young to go in so I sat outside with Aunty Nell. What year that was I don't know..(sounds like 1955 – DJ). As to staying in Figheldean we seemed to spend a lot of holidays at 300, i never liked the spiral staircase it never seemed solid to me then.I also remember having to get the vegies ready for dinner, there seemed to be mountains of peas to be shucked, and potatoes to peel and beans to string. All from the garden of course. Aunty Dot was my godmother and we had a lot of time for each other. She held an engagement party for Jack and myself and coming to Figheldean by the back road from Bulford in the fog we missed a corner and went through a barb wire fence nobody hurt tho. Of course we all caught minnows down at the mill, I still go down for a look when I am lucky enough to go back home. 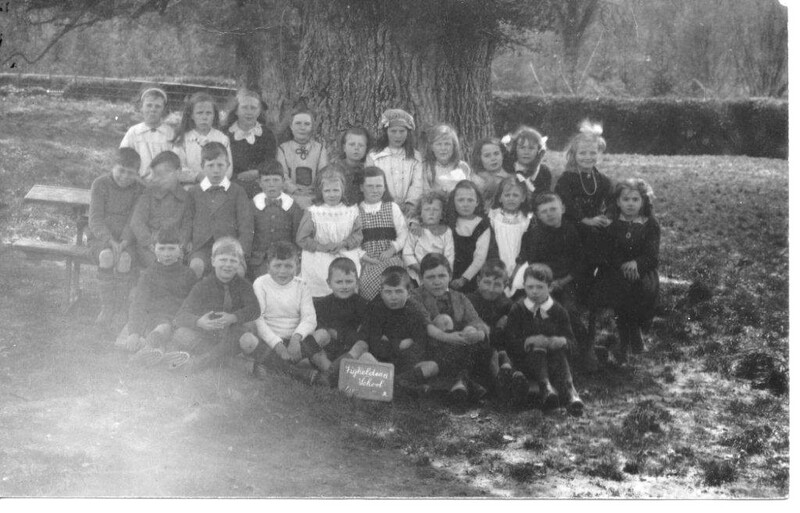 This photograph of Figheldean School Class 2 was sent by Cousin Jim, for which many thanks. The date is probably around 1918. It is generally agreed that the third and second girls from the right, in the back row, are Nell and Jean. Do any of you recognise anyone else?